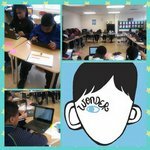 Abrams Elementary: Highlights - Wonder, the Novel! Mrs. Holyfield's fifth grade class is reading and annotating the novel, "Wonder" by R. J. Palacio! There is always something good going on in our classrooms.